I love browsing around on tumblr looking at nail polish posts. I’ve been doing it for months almost every day, just to get inspiration and to hear about new collections. I found a girl’s tumblr page last winter who would make her own nail polish, which then in turn inspired me to start making my own as well. NailingIt has some of the coolest nail of the day and franken polishes and a few months ago she started selling her creations. After stalker her etsy account for about a month I was able to snag 3 of her creations just as they went up. Hare Polish “A-Positive” is an awesome jelly red with big pieces of silver and red glitter. 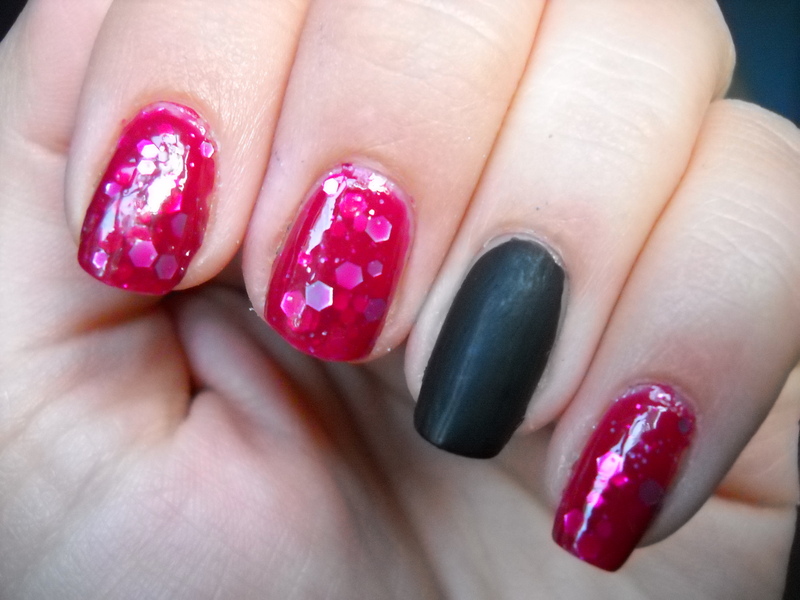 This is just one coat which makes this polish even more amazing because its opaque and glitter packed in just one coat! Then to make it a little more edgy, because I can’t have just a red nail and be satisfied, I added the matte black “Whats a Tire Jack?” from Sephora by Opi for the contrast with the shiney finish of the jelly. All day long I kept thinking of how I loved the rock type vibe I got from the red and black. This manicure might have to be a staple around halloween! What do you guys think? ← Top 10 Nail Polishes for Summer!! I love this! The contrast between the matte and shiny looks so good!